HAMBURG, N.Y. — Khun Ratha A, after spending a brief time at Monticello and Yonkers Raceway since arriving from Australia, made his Buffalo Raceway debut on Saturday night (Feb. 3) an impressive one by easily brushing by the field to register a 1-1/4 length victory in the featured $11,000 Class AA Open Handicap. Under the guidance of owner/trainer/driver Larry Stalbaum, Khun Ratha A ($5.10) went three wide heading to the three-quarter pole and blew past the pace-setting and second place finisher Title Town (David McNeight III) in 1:56.1 to secure the win. Dark Horse (Ray Fisher Jr) took the show position. Title Town and Western Rockstar A tussled to the opening half in :57.4 over the good track and that battled proved to be the perfect setup for Khun Ratha A. Sitting fifth, Stalbaum directed Khun Ratha A to go three-wide and the tandem confidently cruised to the top around the final turn and never looked back. It was the second win in four starts this season for the 9-year-old gelded Khun Ratha A (Bettor’s Delight-Calafia). 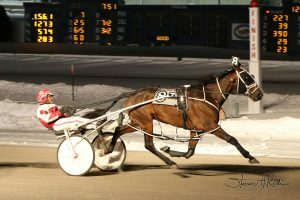 The win pushed his seasonal earnings to $12,660 and $176,028 lifetime. In the $9,500 Class A event, Beachy Dream went gate-to-wire in 1:57.3 to defeat RM Hawk by a half length. Shawn Gray drove the winner to the popular $2.20 score for owner Mike Torcello and trainer Gerry Sarama. Billy Davis Jr. got off to a great start on the season by notching four wins in the bike while Drew Monti added three and Gray a pair. Trainer Maria Rice found the winner’s circle four times with Sarama getting a double. Racing will resume on Wednesday evening at 5 p.m. with a nine race card scheduled. Khun Ratha A has successful Buffalo Raceway debut.